"Wear the rainbow!" 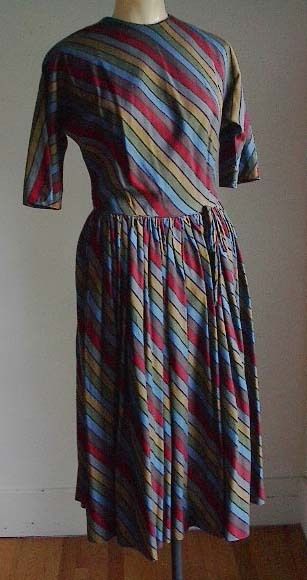 is what old-clothes.com (hmm, somebody needs some marketing help there on the URL, in addition to a refresher course on ROY G. BIV) exhorts us to do with this dress, and if it were a size bigger (or I were a size smaller–it's B34 W26) that's what I'd do. It's only $16! Be sure to click through the rest of this site — there's tons and tons here, most in good condition and extremely well priced, and the pictures are good. It's a keeper.